Southfield James Hardie Siding | Southfield James Hardie | Southfield James Hardy Siding | Southfield James Hardie Fiber Cement SidingMcGlinch & Sons CO.
McGlinch & Sons Co. Home Improvements is a certified James Hardie Siding preferred remodeler for customers throughout the Greater Detroit Metropolitan Area and Southern Michigan. We are highly regarded throughout the region for our outstanding James Hardie Fiber Cement Siding and our incredible team of experts. Furthermore, as a family-owned and –operated business, we have been offering exceptional services to customers since 1917! In fact, customer satisfaction has always been our top priority, and it is without a doubt a significant reason for us being in the business for close to 100 years! We are well-known for dealing with all aspects of exterior construction and we are celebrated as the finest in James Hardie Siding installation. James Hardie Siding is considered to be America’s #1 Brand of Siding. Not only will it augment the beauty, safety and durability of your home, but it will also improve your home’s value and curb appeal! Besides that, James Hardie Fiber Cement Siding is low maintenance and thoroughly resistant to whatever nature delivers! Whenever Southfield residents are looking for the best siding in the industry, they head directly to McGlinch & Sons for our remarkable James Hardie Siding products. HardiePanel Vertical Siding (for that board-and-batten appearance). 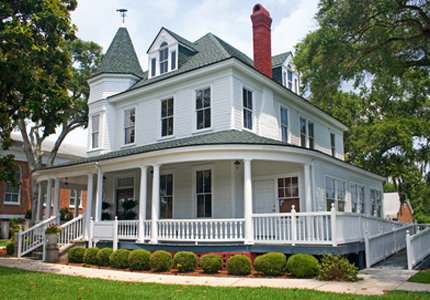 Additionally, McGlinch & Sons’ James Hardie Siding surpasses both vinyl and wood siding. In addition to being five times thicker than vinyl, James Hardie Siding is noncombustible, fade resistant and weather resistant! James Hardie Siding puts an end to scraping, repainting, and eliminates moisture and rot from rain, snow and humidity. Also, as so many of our fans on the Eastern Seaboard discovered after Hurricane Sandy, James Hardie Siding stands up to hurricanes as tough as Sandy was! Even though Michigan doesn’t have hurricanes, it is known for damaging snowstorms, hailstorms and tornadoes that can severely damage homes that do not have James Hardie Siding. With its impact-resistance against hail and windblown debris, James Hardie Fiber Cement Siding is often specified by building codes for buildings in hurricane-, tornado- and wildfire-prone areas. For the James Hardie Siding that suits your situation, call McGlinch & Sons today at: (248) 987-6300.